Portal Knights is awesome. It’s a sandbox RPG that reminds me a lot of Minecraft meets action RPG. The trailer will do a far better job than I come at showcasing the breadth of the game’s capabilities. Let’s watch and then I’ll fill you in on a bit of what we’ve experienced thus far. Think Minecraft where you can break blocks. The “world” is broken up into fractured islands must be rebuilt with portal blocks. Traveling between them leads to different biomes with different monsters, items, resources, etc. You can build bases/homes/whatever you want. There’s crafting for weapons, spells, armor, etc., too. Classes are Warrior, Mage, or Ranger with their own abilities and gear. Combat is real time but fairly simple. So far Graev and I have reached level 5. We’re a couple of hours in and have established a little makeshift workshops/home in a level 3 world. We use that as our home and return after adventuring out through other portals. We gather up all our loot then come back to drop it off. With the worlds each having different resources, we find ourselves bouncing around to gather up enough copper ore and coal. Certain monsters are only on certain worlds too so things like Scales (which are used in lots of weapons we can currently craft) become a hot commodity. I’m taking some video that I’ll highlight for you guys. Graev and I are really having a lot of fun playing — it’s up to 4-player co-op Local or steam friends. 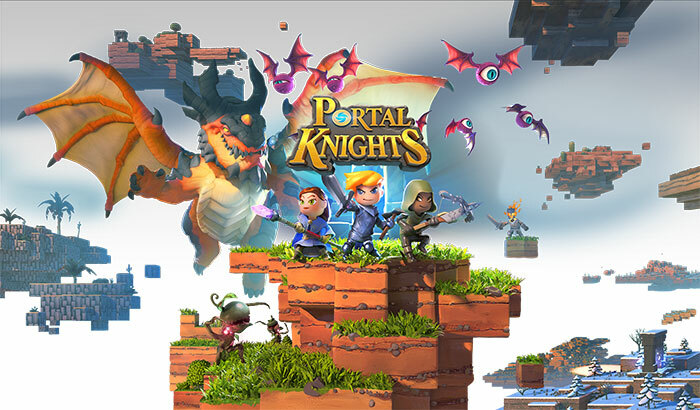 Portal Knights is available on Steam in early access. They are patching the game fairly often, including adding controller support and soon larger worlds. Totally worth the $14.99 I paid and really shining as a sleeper hit for me. I’m really looking forward to the bigger worlds and upcoming patches. I liked the idea behind Portal Knights, but the worlds/zones whatever you want to call them were just too small for me to really get into it. I ended up doing the “refund within two hours” deal. I guess I just need that infinite procedurally generated world to really feel like I can do whatever I want. World size is increasing with the coming patch. I agree that right now they are really small. I enjoyed PK for a about 2 or 3 weeks then just hit the wall. Combat is incredibly simple and there is hardly any real advancement. Granted you go up in levels but you never really seem to branch out horizontally skill wise, only vertically. You have a very few select skills to use and they just increase in power but everything increases proportionally so it really makes no difference. Not to say the game does not have lots of cool aspects. I really like the look and feel. I like that I can play with a controller if I choose. It is incredibly polished at this point, hardly any glitches. I share your feelings about the price, perfect amount. I said I hit the wall after 2 or 3 weeks but I got more than enough enjoyment out of my $15 and I think it is something I will enjoy going back to in another month or two. By any chance have you seen Skysaga? A very similar style game. One advantage they have in Skysaga over PK at the moment is it has a more traditional MMO feel to it. You can go to these central hub islands full of npc vendors, trainers and quest givers and other players are there. I like the look and feel of PK more than SS at the moment but I think SS has a bit more depth to it right now. I haven’t checked out Skysaga yet, I’ll look into it. Thanks for the recommendation! I think that trailer flashed a Keen logo! I also somehow stumbled across several Pokemon Go stories today that had me thinking we might be entering an interesting time. Not necessarily good. A little reminiscent of a book I read really. Just minus the virtual goggles. How did you find this game? I thought I knew most of the Terraria/Minecraft style of games but this is the first I’ve heard of this.